George Stearns, shellfish biologist for the Puyallup Tribe, inspects a sick sea star caught in the tribe’s crab monitoring study. As part of their regular monitoring of crab populations the Puyallup Tribe of Indians is tracking the impact of a mysterious ailment that is decimating sea stars. An outbreak of sea star wasting syndrome was first noticed early last fall in British Columbia. The syndrome starts as small lesions and eventually the infected sea stars disintegrate. Since the syndrome was first noticed, it quickly spread throughout the Salish Sea and along the Pacific coast. While there have been documented outbreaks before of the syndrome, nothing on this scale has ever been recorded. There is no known cause. The tribe regularly monitors eight stations between the north end of Vashon Island and the Tacoma Narrows. Each station includes nine crab pots. George Stearns (right) and David Winfrey, shellfish biologists for the Puyallup Tribe, count and measure crab caught in a monitoring study in southern Puget Sound. When a diseased sea star does catch a ride on a tribal crab pot, it deflates quickly. Within a few minutes, a normally rigid sea star will be hanging on the pot like a wet rag. The main focus of the crab monitoring work by the tribe is to pinpoint exactly when the crab in the tribe’s harvest area molt, or shed their shells. Sea star immediately after being caught. Photo by George Stearns. Sea star five minutes after being caught. Photo by George Stearns. 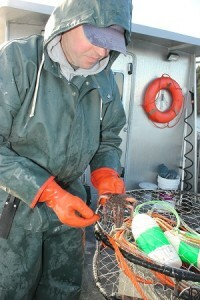 This entry was posted in Environment, Local News and tagged Puget Sound, Puyallup Tribe, sea star by Kim Kalliber. Bookmark the permalink.